Darby Mazzarisi and Gemology. Photos by The Book, LLC. North Salem, NY – May 7, 2015 – Adult Amateur hunter competition at The Old Salem Farm Spring Horse Shows was highlighted today as Darby Mazzarisi of Chesterfield, NJ collected Grand Adult Amateur Hunter Champion honors aboard her own Gemology. On the Grand Prix Field, Mclain Ward kept Double H Farm on the leaderboard today, winning his second $5,000 Open Jumper 1.40m in a row, this time in the irons of the seasoned HH Carlos Z. Six years ago, Mazzarisi thought she was in the market for a “made” hunter ready for the show ring. Instead, what she got was Gemology as a gift from her husband in the form of a 6-month-old Dutch Warmblood/Thoroughbred project. The now seven-year-old mare by Popeye K made a patient Mazzarisi proud today, carrying her to champion in the Adult Amateur Hunter 36-45 Division and staking her claim on Grand Adult Amateur Hunter Champion. Despite inexperience on paper, Gemology was flawless in the ring during the past two days. After winning both over fences classes yesterday, she was second under saddle and jumped to first and third today. Reserve Champion in the Adult Amateur Hunter 36-45 Division was presented to Lily Maddock of New York, NY and her own Mosaik. She was sixth, third and jumped to second twice over fences, and was fourth under saddle. Nilani Trent of New York, NY and her own Autumn Rhythm won both over fences classes yesterday before jumping to first and second today for Champion in the Adult Amateur Hunter 18-35 Division. Trent and Amelia McArdle’s MVP took Reserve after second and fourth-place finishes yesterday, sixth under saddle and taking first over fences today. Ann Misenheimer dominated the Adult Amateur Hunter 46 & Over Division, earning Champion aboard Westerly Farm’s Cornerstone and Reserve Champion with Westerly Farm’s Conmetro. Misenheimer won both over fences classes aboard Conmetro yesterday and picked up a second-place ribbon with Cornerstone. Today, she was third under saddle on Cornerstone before winning both over fences classes, and sixth under saddle with Conmetro together with fourth and seventh over fences. With the completion of this week’s classes counting towards the $5,000 Leading Hunter Rider Award, presented by Old Salem Farm, Holly Orlando has a commanding lead with Sandy Ferrell second and Louise Serio third. The Award will be presented at next week’s $10,000 USHJA International Hunter Derby, presented by The Gochman Family, on Saturday. Riders for Double H Farm captured first and second-place ribbons in today’s $5,000 Open Jumper 1.40m with Ward of Brewster, NY taking blue on HH Carlos Z. He stopped the clock at 57.784 seconds in the speed-format class. “We have a great team! It’s nice to see the young horses developing well and the seasoned horses having good results,” said Ward of the recent success for Double H Farm. Quentin Judge of Ridgefield, CT followed Ward in second with HH Eli Cash just one second shy of the lead in 58.782 seconds. Kirsten Coe of Wellington, FL rode to third aboard Hunter St. Anna Z for Lövsta Stuteri in 61.746 seconds. Coming off a win in the $500,000 Rolex Grand Prix CSI 5* to close out the season in Wellington this winter, HH Carlos Z remains in top form going into the summer season. 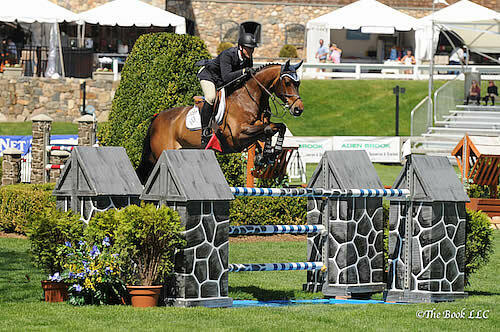 And, according to Ward, the 13-year-old Zangersheide gelding always shines at Old Salem Farm. Today he was true to form taking the course, set by Michel Vaillancourt of Aiken, SC, in stride with a specific goal coming up this weekend as the fences climb higher and the prize money increases. Two wins over two days has Ward firmly leading the $20,000 Leading Jumper Rider Challenge, which will be awarded at the conclusion of the $100,000 Empire State Grand Prix presented by The Kincade Group next Sunday. Peter Lutz currently sits second with Judge and Molly Ashe tied for third in the standings. Competition continues tomorrow at the Old Salem Farm Spring Horse Shows with the $6,500 Open Jumper 1.35m before the $35,000 New York Welcome Stake, presented by Old Salem Farm, takes center stage at 1 p.m. For hunters, Amateur-Owners kick off their divisions, and the spectator favorite $1,500 Canine Puissance shines the spotlight on a different four-legged competitor at 3 p.m.